It's a dear friend's birthday today and while I'm not here to celebrate with her (this is a scheduled post while I am traveling in Mongolia), I will be thinking of her happily dancing. To everyone born on July 22: happy birthday! To anyone determined to enjoy today: have a beautiful, beautiful day! 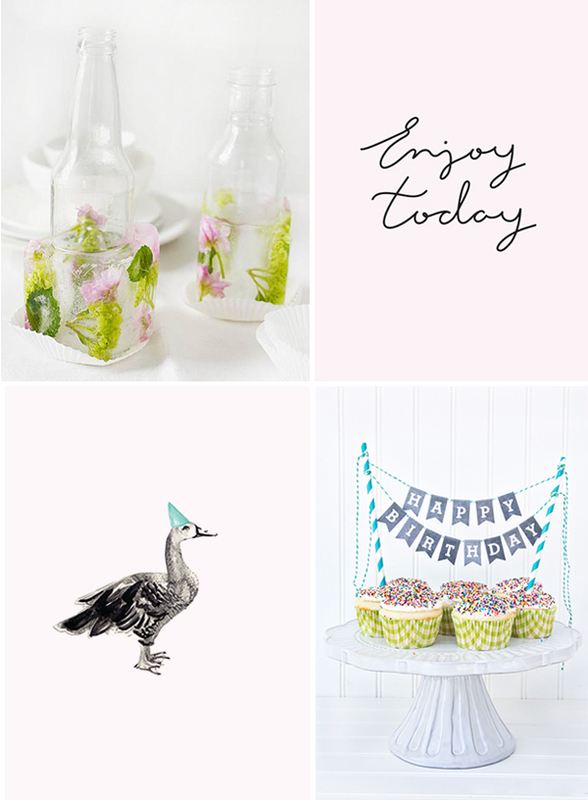 DIY floral ice bottle chillers from Sweet Paul | Enjoy Today typography by Erin Heroux of Honest Agency | Goose with party hat card by Gentle Arts | Free printable chalkboard letters cake bunting by Yellow Bliss Road. happy b-day :D greetings from chile. Aw, such a beautiful post. I hope you're enjoying yourself today + happy birthday to your friend. i am enjoying your posts!!! @SuzyMcQ: So sorry about that! The link should be fixed now.